The Supreme Court could issue a ruling in King v. Burwell, the lawsuit threatening to undermine a key part of the Affordable Care Act, as early as Thursday. But the debate over President Barack Obama's controversial health care law is likely to continue no matter how the justices rule. And one reason is that Americans, on the whole, remain deeply ambivalent about it. 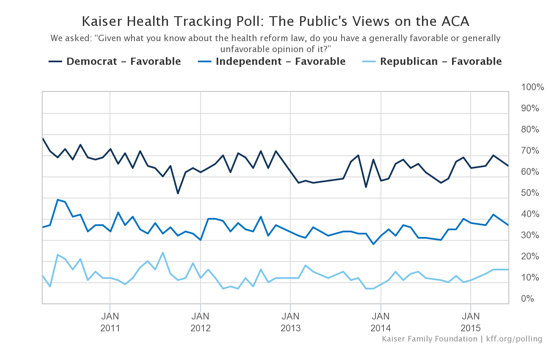 While the popularity of "Obamacare" has fluctuated a bit in the five-plus years since it became law, the amazing thing is how little public opinion has changed. Roughly speaking, a little more than 40 percent of Americans approve of the law, while around 50 percent disapprove -- though the precise numbers vary a bit from survey to survey. 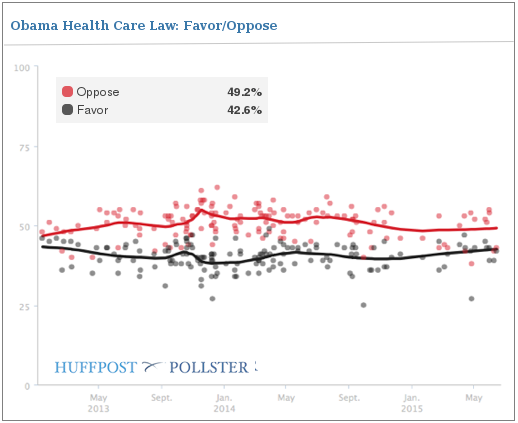 The public doesn't support repealing the law, as Republicans would prefer, and at least some people disapprove of the Affordable Care Act because they like the idea of it but wish it went further. But Americans have not wholeheartedly embraced the law, as its proponents have long hoped. The ACA's critics, who throw around words like "debacle" and "train wreck," say these tepid polling results are proof that people directly affected by the law don't like it. But a review of recent polling, plus some statistical calculations performed at the Huffington Post's request by researchers at the Henry J. Kaiser Family Foundation, which studies national health policy, suggest two other factors are driving public perceptions. 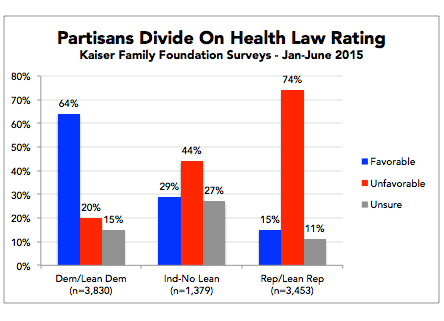 The first and more obvious factor is partisanship. No single characteristic better predicts how a person feels about the health care law than his or her partisan affiliation. Republicans tend to think the law is a failure, while Democrats tend to think it's a success -- most likely because they are reacting to the party leaders and news sources they trust and distrust and because they have genuine philosophical differences about the law's virtues. The other factor is the changes that people see in their health insurance every day -- changes that often have nothing to do with the Affordable Care Act. Many of the problems that spark complaints about Obamacare, such as rising out-of-pocket costs, might be worse if the law did not exist. Here's a breakdown of the data. 1. Cancellations and "rate shock" made one group of people very angry. The Affordable Care Act rewrote the rules for private insurance that people buy directly, rather than through employers, in order to make coverage more comprehensive and more widely available. That raised the underlying costs of these policies, since previously carriers could sell plans that left out key benefits (like prescription drugs or mental health) or simply refuse insurance to people who already had medical problems. Insurers responded by canceling the old plans, charging higher premiums to some existing customers or some combination of the two. To offset the higher prices of policies available through Obamacare the law offers tax credits, but those credits are worth less to people with higher incomes. That's a big reason why Kaiser's surveys show that, among people buying coverage on their own, people who lost their old plans were the most likely to say that the law had negatively affected them. 2. But cheaper, better coverage made another group (probably a larger one) very happy. The dismay of people angry over higher premiums got all the press when the Affordable Care Act's coverage expansion first took effect. But the overwhelming majority of people buying coverage through the law's new exchanges, who likely make up more than half of all people buying coverage on their own, say they are pleased with the policies they've gotten. A recently released Commonwealth Fund survey found that 81 percent of those enrolled in health plans through the Obamacare marketplaces are very or somewhat satisfied with their insurance. Similarly, a Kaiser Family Foundation poll of people in the non-group market finds 74 percent of those enrolled in ACA-compliant plans rate their coverage as excellent or good. The same surveys find these Americans happy with their quality of benefits and access to physicians, despite all of the complaints about "narrow networks" of providers. Most are also are satisfied with the premiums they are paying, undoubtedly because tax credits discount the price deeply for so many of them. 3. And most people haven't been directly affected by Obamacare at all. The bigger reason to doubt that firsthand experience is having a big effect on public opinion is that the law simply hasn't touched that many people in ways they are likely to detect. Remember, the parts of the law that get by far the most attention -- the tax credits, the rules about pre-existing conditions -- affect only the "non-group" market. Estimates on the size of this market vary, but the number is probably somewhere between 10 and 20 million people. That's less than 10 percent of the population. Most people get coverage through employer-sponsored insurance, Medicare and Medicaid -- which have changed, but largely in ways that would be invisible to most consumers, at least for now. 4. Politics is a huge factor. The most telling sign about the influence of politics is that even among Americans surveyed in the non-group market -- the roughly 10 percent of the population most directly affected by the ACA -- partisanship was the most important driver of opinions on the law, according to a regression analysis that researchers at the Kaiser Family Foundation performed for HuffPost. Overall, 64 percent of Democrats in the non-group market rate the ACA favorably, compared to just 19 percent of Republicans. Once the Kaiser researchers controlled for party affiliation in their analysis, none of the other factors they tested -- including demographics, health status and the characteristics of their insurance -- turned out to be significant predictors of a person's overall ratings of the ACA. This is consistent with other survey results, including a detailed poll from Vox several months ago that documented widely different perceptions among Democratic and Republican respondents. 5. But partisanship alone isn't the whole story. Powerful as it is, the continuing partisan divide cannot tell the entire story. If it did, then the health care law would have a net positive rating, since more Americans identify or lean Democratic than Republican. When Kaiser researchers -- again, at HuffPost's request -- tallied more than 8,000 interviews they'd conducted over the course of the year they found that intensity of opinion is much stronger among Republicans than Democrats and that Republicans are more likely to rate the law unfavorably than Democrats are to rate it favorably. 6. If it's health care, people assume it's Obamacare. So what's the mystery factor? The best guess is that people are holding the law responsible for all of the problems of the health care system -- including those like rising deductibles, narrowing hospital networks, or even long waits at the doctor's office that most experts believe have little or nothing to do with the law itself. Maybe the single best example of this is the reaction to rising costs that polls have detected, especially among those largely unaffected by the changes to insurance mandated by the ACA. 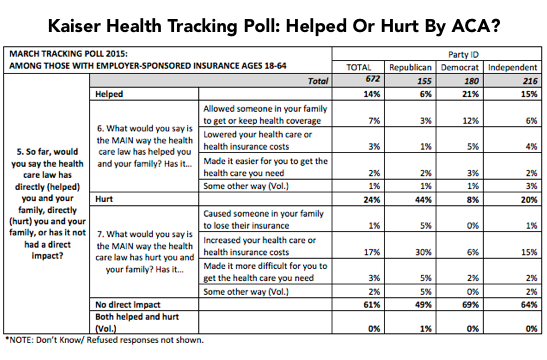 In the March Kaiser tracking survey, just over a third of Americans with employer-sponsored insurance reported that the new law had "directly hurt" (24 percent) their families. Why? On a follow-up question, most respondents -- including 30 percent of all Republicans, 15 percent of independents and 6 percent of Democrats -- said it was because the law "increased your health care or health insurance costs." But insurance premiums go up every year. That was true before the ACA became law and it remains true after. And since the law's enactment they've actually risen more slowly than before. The historically low inflation is actually one of the most remarkable developments in health care today. And while economists debate over what role, if any, the health care law has played in this progress, there's no compelling evidence that the law has made employer insurance premiums -- the premiums most people see -- rise more quickly. Similarly, out-of-pocket costs really are rising and they are rising more quickly than wages, which is a big reason why people feel their impact. The law's critics frequently complain about rising deductibles, as if the law were responsible for them -- citing, among other things, a recent Commonwealth Fund report on the increases in out-of-pocket costs for consumers. But as Sara Collins, a vice-president of the Fund and co-author of that study, told HuffPost, "the trend in higher deductibles began well before the Affordable Care Act... the trend is entirely separate from the Affordable Care Act." In fact, for people buying coverage on their own, the law sets limits on out-of-pocket expenses that insurers can charge -- something that many plans lacked before. In retrospect, it's not surprising that so many people assume the Affordable Care Act is to blame (or, in some cases, to thank) for the changes they are seeing. By enacting such sweeping legislation, Obama and his allies tied their law to everything that happens in health care -- good and bad and in between. And by largely avoiding changes that affect most Americans, they gave most people little reason to doubt the cues they get from the news and their partisan leaders. Most people don't have the time to think through historical counterfactuals -- to imagine what life would be like if the law had never passed, its protections did not exist and health care costs were rising as quickly as they did previously. In much the same way, few people stop to think what might happen if they got really sick and needed insurance to cover potentially catastrophic bills. Even people who care about security tend to undervalue it, until crisis actually strikes. Obama and his supporters like to say the law is working -- that it is helping way more people than it is hurting and that the benefits justify the costs. They have plenty of evidence to cite in their defense. That doesn't mean the public will believe them.